Red, yellow or green. Nope, I’m not describing a flag, nor are these the latest color trends in fashion, but rather, they’re the colors of an Asian spice: the curry. Although curry originated from India, this spice is widely used among the East Asian as well as the South East Asian cuisine. Its color tells you how spicy it is – with red being the most spicy (from red chilies), green-medium (from green chilies) and yellow, mild (from cumin and turmeric). I like ’em all but prefer having them cooked Thai-style, which means, with coconut milk. Combining the curry with coconut milk tends to be more aromatic, it seems to me. 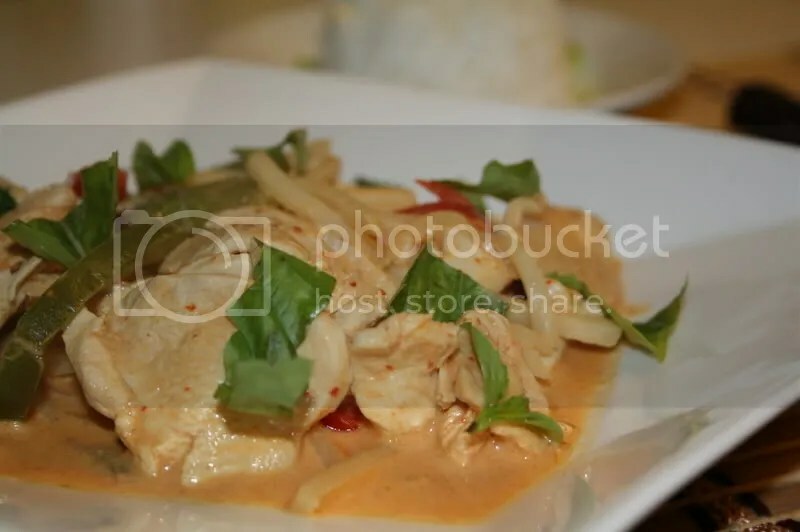 My husband and I love red curry. There’s a small Thai-Chinese restaurant we go to when we’re craving for Thai food. 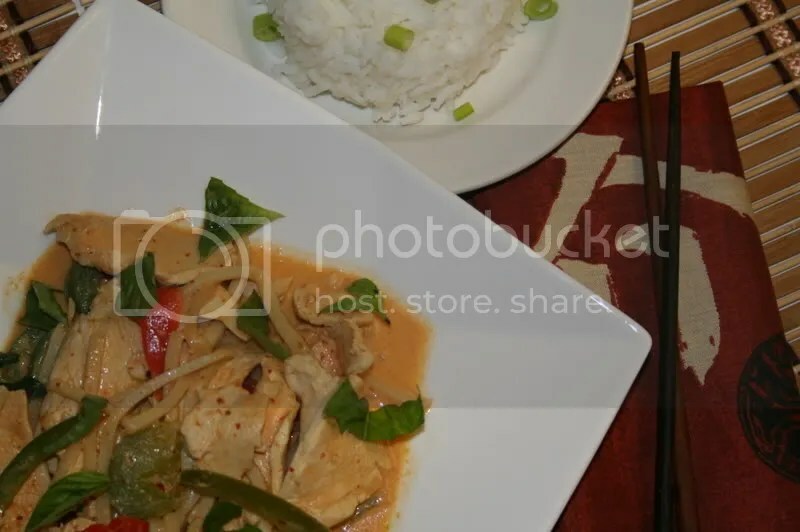 It’s a hole-in-the wall place, but man, their chicken with red curry is the best. I’ve been craving for red-curry chicken these past days, but this time, I resolved to make it myself. And boy did I enjoy this dish. It’s even better the next day! 1. Heat oil in pan. When hot, saute onion ’til translucent. Add garlic. 2. Then add chicken pieces. Saute till chicken have turned white. 3. Add red curry paste and stir till curry is well incorporated and oil comes to surface. 4. Then add half of the coconut milk, fish sauce, sugar,bamboo shoots. Go easy on the salt, as remember, the fish sauce is already salty. 5. 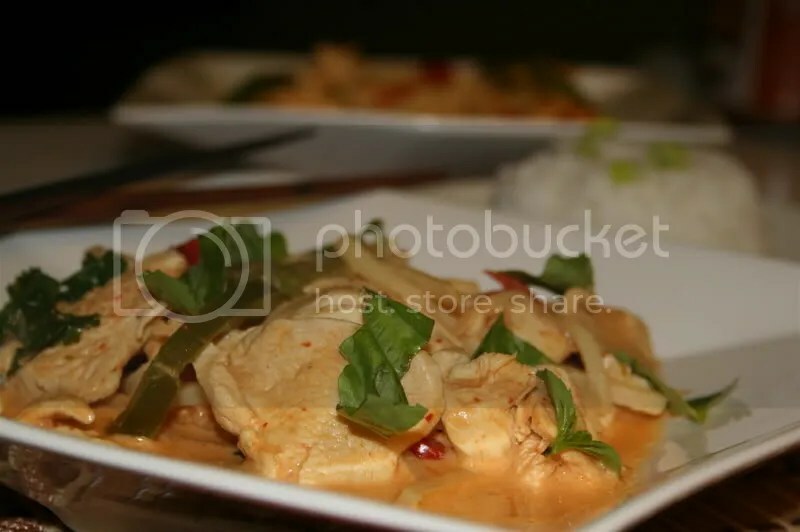 Then, let the chicken simmer in coconut milk for about 3-4 minutes or until chicken is thoroughly cooked. 6. 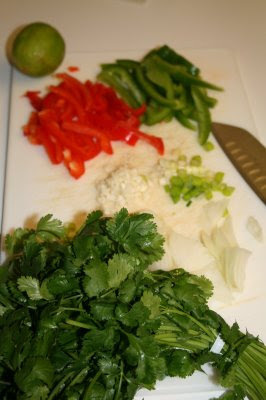 Then add the rest of the ingredients: red & green peppers, green onions,the rest of the coconut milk. If using kaffir lime leaves, add them at this point. Adjust seasoning. Simmer for 1 minute more. 7. Before serving, garnish with basil leaves and/or cilantro. ***NOTE: 2 tbsps red curry paste might be too much, so I suggest you start by adding 1 tbsp first. I got carried away and added 2-1/2 tbsps. My hubby found it a bit too spicy. He added a more sugar to balance the heat.